Hey readers! 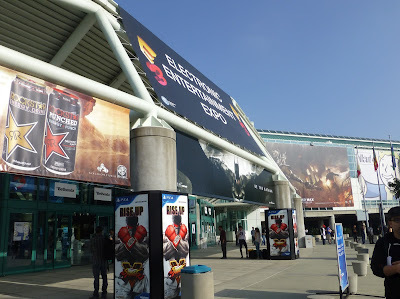 For the first time, I was able to secure a pass to E3. It was three straight days of hype, standing in lines, and, of course, playing upcoming video games. I played a lot of games, so here's where I'm putting all of my impressions for everything I tried. Keep on reading, or CTRL+F for whatever you're most interested in. Part 1: Nintendo Games - You are here. The new controls take a little getting used to, but seem like they'll be better in the long run thanks to being able to aim independently from your ship movement. It almost seems overpowered that you can shoot completely sideways or directly below or above your arwing, but the level design appears to be made with this in mind and encourages you do use this method. For example, the Corneria mission features enemies crawling on the ground with weak points on top of them which would be hard to hit without using the gyro controls. Another handy feature is the ability to hold ZL to swing the camera around to your point of interest. This makes it a lot easier to find your enemy or other important location than it was by using the minimap. The graphics are pretty alright at a glance, but up close and in comparison to other modern games, they're lacking. The terrain especially has noticeably mediocre textures and decorative objects are a bit sparse. There are only two levels (and a training stage) on the demo, but they seem to play more like Star Fox 64 than Assault or Command. The Corneria stage demonstrated the traditional on-rails mode, followed by all-range mode for a dogfight and boss battle. Interestingly, the boss battle could be won in two different ways, with one method making use of the walker transformation. The other demo stage was exclusively in all-range mode and had you fighting against enemy ships and Pigma. It remains to be seen whether the game will have amiibo compatibility, branching paths, and medals for getting high scores on each level, but those things do seem likely. Also worth noting is that the hidden medals from Star Fox Assault are back and hidden throughout the stages. Tri Force Heroes obviously uses a modified version of the engine from A Link Between Worlds, and that's just fine. It plays as well as you'd expect, but sharing a life bar can make it challenging if someone on your team is bad or a troll. Also, since you're dealing with other players, it can be hard to predict what they'll do, so it's easy to accidentally knock them into an abyss. New to the series, notifications about your teammates periodically scroll across the screen NicoNico Video style to let you know when someone gets hurt, finds rupees, or picks up a heart. The notifications are handy somewhat, but I don't think anyone really needs to know every time someone picks up five rupees. Overall though, it's a really fun game and manages to capture the fun of Four Swords Adventures while making it more cooperative and puzzle-based. It'll definitely be a blast to play if you can find the friends to join you. This one is a fairly standard platformer, but it has the gameplay mechanic of hitting things with your cord and grappling onto stuff. It doesn't stand out all that much, but it seems to be a good platforming game if you like those (I do). Hopefully the actual game isn't broken up quite so much by unnecessary dialogue like the demo was. I have a feeling this game will go under everyone's radar since there have been so many 2D platformers lately, but fans of the genre should definitely keep a lookout for this one. Also, amiibo collectors will want the Chibi-Robo amiibo that comes packaged with the game; it's very nice looking. I'm not super familiar with the Mario Tennis series, but this one definitely looked and played well. There were a lot of different hits you could do, including an apparently new jump shot which was achieved by pressing A twice or B twice. Also new to the series, mega mushrooms periodically appeared to make you giant and have a wider range to hit the ball as well as more power. While going mega did look cool, it ended up feeling more like a delay of game since it's nearly impossible to miss while mega. Furthermore, getting a mega mushroom seems to be just an eventuality since they just appear after playing for a while, regardless of anything you do. Finally, this might've been in previous Mario Tennis games too, but there are circles that appear which allow you to do powered up shots if you press the button that corresponds to the circle's color while standing inside the circle. Or, if you're bad, you can just mash X and it'll do a special shot. 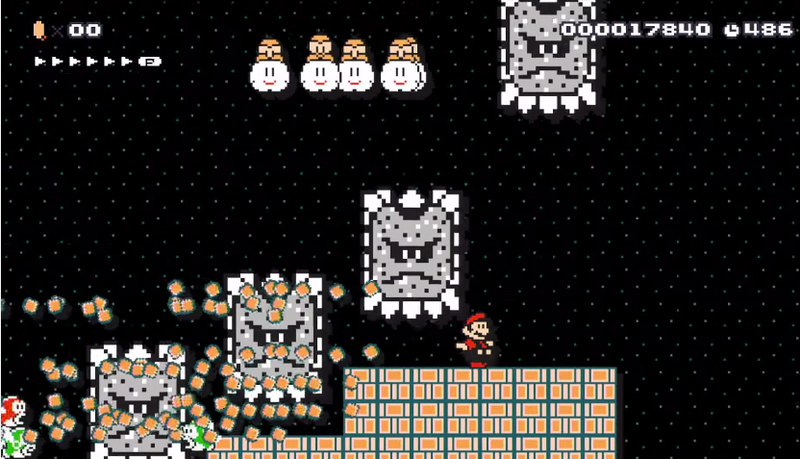 Although not officially revealed, the different characters did seem to have varying movement speed and power. Overall, this game seems like it'll be fun for casual players and offer a lot of depth for those who wish to master it as well. Here's hoping it has more to do than the 3DS version did. This game looks simple, but I actually really enjoyed it and am interested in seeing how strategies will develop for it. Basically, you have two teams of three players and the goal is to shoot the giant ball into the other team's goal. This is made more complex because you're able to either charge your shot or shoot rapidly, but either way your gun has a cooldown so you have to be strategic with how you use it. You can lock onto the ball to strafe around it (or dash with B like in Metroid Prime), but you can also hold R to use gyro controls for more precise aiming. This allows you to aim at specific parts of the ball to influence its movement and spin it to the side or chip it into the air. For each goal that is scored, the goal gets smaller and harder to score on too. Also, getting hit by the ball damages your mech which can eventually be temporarily disabled. Then, there are items that periodically appear which can force the opposing team to eject from their mechs, give you a temporary shield, or increase your speed temporarily. A final twist is that on rare occasion (maybe one in five matches), the ball will drop with different qualities. The two I saw made it molten lava (presumably doing more damage if you touched it) and rubber, which affected its bounce physics. Without some arena variations, I could see this game getting old after not too long, but for being just a side minigame as a part of Metroid Prime Federation Force, it's pretty darn fun. You can probably tell what this game entails by watching a few videos, so I don't feel the need to go into it too much here. It plays just like SMB1, SMB3, SMW, and NSMBU (you have the option to change which game your custom level is based on), but there's a whole lot of really cool design stuff you can do in it. There are a lot of new assets that were created for it, like wearable helmets, stackable enemies, rideable Bowser clown car, and enemies, objects, and music which normally wouldn't exist in certain games. It'll definitely be a blast to play everyone's custom levels. Also, a cool thing to note is that you can see each level's clear rate and feel good about how much better you are than everyone else. For this game as well, I don't feel like I have to explain too much since it's already out in Japan. Essentially it plays like Yoshi's Island, but with a health meter rather than Baby Mario. The yarn-styled graphics are absolutely adorable, but more importantly, the level design is fun and challenging. It can be played in two player co-op, and in this mode it seems that you have unlimited lives as long as both players don't die at the same time. 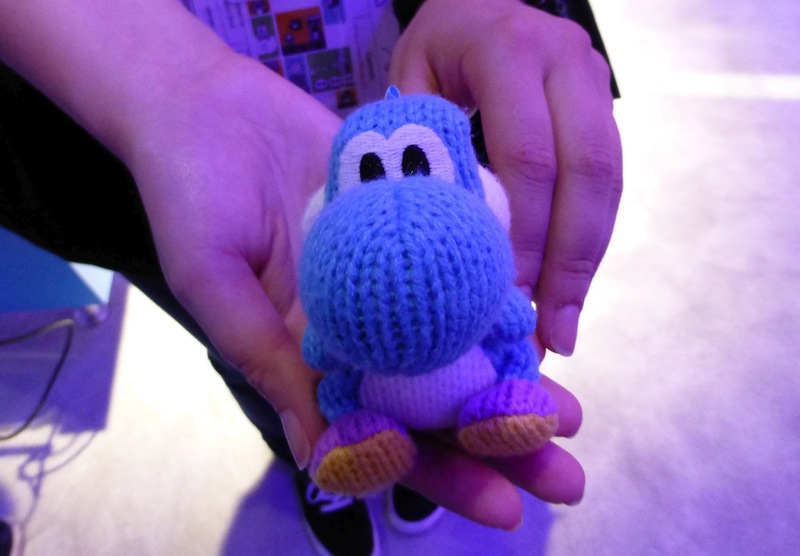 Similarly, using a Yarn Yoshi amiibo will create a second Yoshi on-screen which is controlled at the same time as your regular Yoshi. 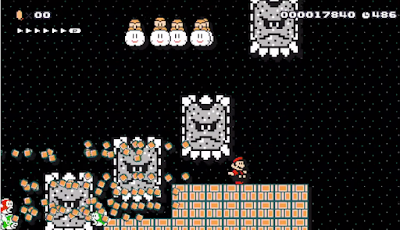 Just like in co-op, if one of the Yoshis falls, it will reappear for you, so you can focus on one Yoshi at a time without worry. I didn't get much time to try Yo-Kai Watch, but since it's been out in Japan for a while and is hugely popular there, you can probably find everything about it elsewhere. What I did see though, is that it looks very nice graphically and seems fun and fluid to play (the run speed is delicious). Even though the Yo-kai I captured were scripted events, it was still satisfying to capture them. I can definitely see this catching on outside Japan in the same way that Pokemon has. 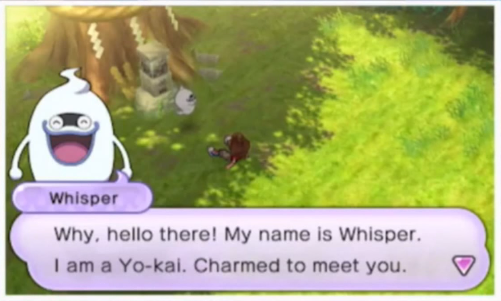 It's probably good that they left the word "Yo-kai" as it is rather than scaring parents with some translation of negative spiritual/ghostly connotations in English. 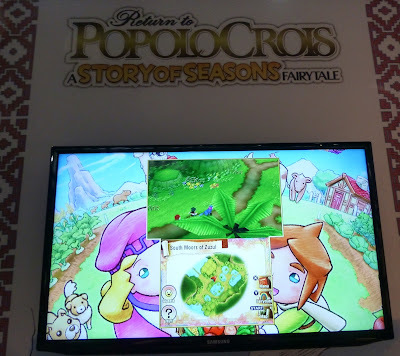 This game was lonely and had nobody playing it, but from what I saw it definitely deserves to be on the radar of those who enjoy RPGs and games like Rune Factory and Harvest Moon. Apparently, this game has you living in a town and trying to heal the land by farming, talking to and doing quests for the locals, and fighting monsters. The battle system is turn based like good old classic RPGs, but it also has a grid-based system of movement which has you moving each character on their turn into strategic positions. Your position in battle not only gets you in range to attack or hit more enemies with an AoE spell, but apparently positioning has other benefits as well (attacking from behind for higher damage, for example). The demo had yet to be fully translated, but I was told that the American release would feature English voice acting, though they still hadn't decided on whether dual audio would be available. Welcome to What They Call Games' first year of E3 coverage, directly from the show floor! I already detailed my impressions of the Nintendo demos and now it's on to all the other games I tried. Keep on reading! Part 2: More Games - You are here. After waiting in line for 4 1/2 hours (not including the hour or so waiting outside the show floor), the people I was in line with who would later be on my team for the demo were horrified to learn that I had only played Halo games for a total of twenty minutes or so in my life. There's nothing wrong with only owning two out of three consoles, alright? 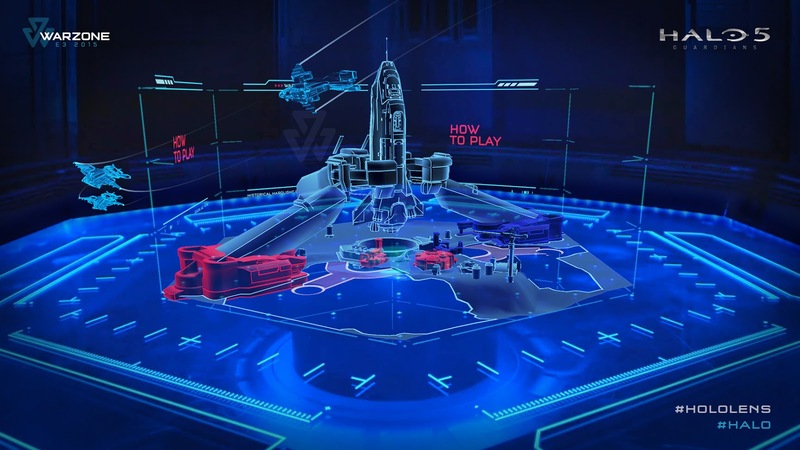 Anyway, I'll go more into the HoloLens portion of the demo in the next section, but the Halo 5 demo had us on teams for Warzone mode. Forgive me if this is a poor comparison, but it reminded me of Destiny's Control mode in the Crucible. To explain it simply, both teams raced to get 1,000 contribution points by scoring kills, capturing points, and defeating boss characters, but you can also win instantly by controlling all of the points and destroying the enemy team's core. It's really cool because it combines so many different aspects of the genre into one chaotic (but not overly so) game mode. 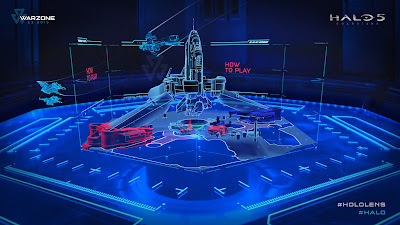 The match starts with securing your starting area and defeating AI-controlled enemies. Once an area is in your control, you gain the ability to access an upgrade point to acquire new weapons and vehicles according to how well you've been doing in the match (a nice relief from the way Call of Duty gives bonuses to people who have played for ages). From that point onward, it's a tug-of-war battle to control all of the strategic points and push your way into the enemy base. In my match, even though our point totals were similar, my team was on the verge of loss for part of the game due to our core being vulnerable at one point. This led the opposing team to have an increase in points as well, but thanks to the large point bonus of defeating the AI boss characters, we were able to jump back into the game. It was perhaps that morale boost that allowed us to also recapture another point to protect our core, although we did still lose the match by a mere seventeen points in the end. At the time, I'll admit that I wasn't overly impressed by Halo 5. It's just another great FPS game with a few variations, but looking back at all Warzone had to offer makes me see the potential that it has. I think fans are going to love it. On my final day, I had just enough time to try out one more game with a short line. I'd heard Plants vs. Zombies moved quickly and had a nice free shirt, so I went there even though I've never played a game in the series before (and I found out later they were out of shirts). To my surprise, this game is actually pretty fun. It's a team-based third-person-shooter/beat 'em up in which players work together to protect their area from waves of enemies. 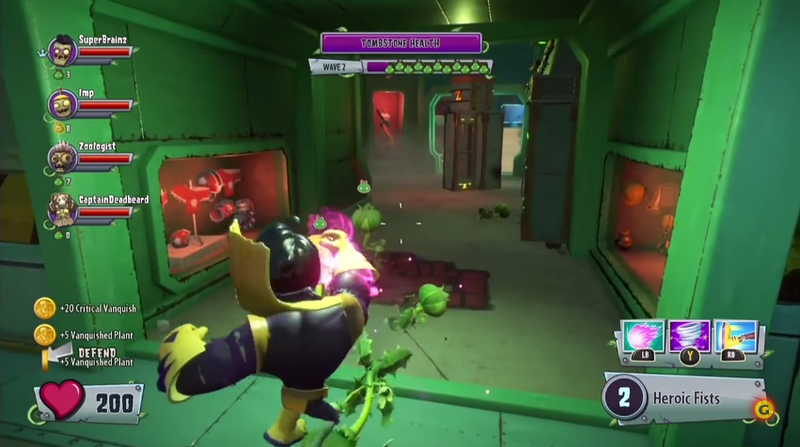 There are different player classes which each have three unique special attacks that you can use periodically with a cooldown system. Between waves of enemies, you can heal your teammates and build defense turrets at certain locations. After a few normal waves, we faced a randomly chosen boss character wave, then had to escape to a pickup point within a generous time limit while enemies went wild. Honestly, the game doesn't bring a whole lot new to the table, but it's still fun to play and offers a family-friendly option into the online shooter genre in the same way that Nintendo's Splatoon and Blast Ball do. I had fun playing it even without expecting to. 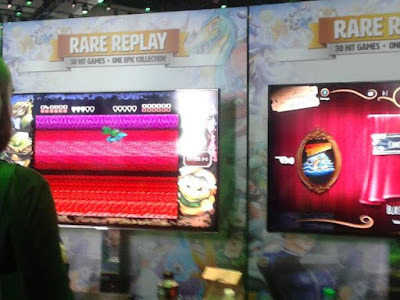 It's a collection of thirty games made by Rare. That's a lot of games and it's a lot of good games too. There's not a whole lot to say about it since it's just a compilation, but some games offer the ability to do a five second rewind, which makes nigh impossible games like Battletoads and Cobra Triangle a lot more accessible. It apparently also includes a documentary about Rare as well as a mode with short challenges from different games a la NES Remix. Previously online games will still be online as well. Good deal! I'm as much of a sucker for unique art direction as the next guy, but does this early-Disney-animation-inspired run and gun deserve all of those best of E3 stickers? It's hard to say. Like I said, the art style is definitely unique and the animation is fantastically done, but it's also not as original as it could be since it's very clearly copying the style of old-fashioned Disney. As for the gameplay, the demo consisted of several different boss battles which were surprisingly unforgiving. While the bosses' visual designs were pretty brilliant, their attack patterns didn't feel like anything I hadn't already seen in NES and SNES games of the genre. Cuphead also offers two-player co-op, which is a godsend if you're struggling with the challenging bosses. It's too early to tell if this game will be a good game, but it certainly is a cool animation presentation. Similar to Plants vs. Zombies, I never had any particular interest in the Skylanders series, but hopped in this line for the exclusive figure they were giving out. Once again, to my surprise, Skylanders Superchargers actually seemed to be a pretty good game. It was fairly straightforward - you make your way forward by smashing through enemies, solving simple puzzles, and driving vehicles - but the graphics were very crisp and nice and the gameplay was pretty satisfying. Apart from its toys-to-life gimmick, it still didn't seem to offer anything too unique, but it's at least a solid gameplay experience that I can now stop judging people for enjoying. Nobody was playing this game at all. What you have here is what I imagine the people who made Centipede would've made if they had modern technology. It's a game of running around a city, shooting giant spiders and ants that are invading earth and attacking people. It's pretty darn mindless, so if that's your thing, it's the right game for you. Apparently it has a buttload of missions and a few different playable classes (one of which flies). According to the attendant, all of the buildings are destructible, but when I tried to shoot some missiles at one, it didn't seem to do any damage. For a modern game, the graphics were pretty messy. That wouldn't bother me too much, but for a game about mindless action, you kinda want to have pretty graphics to go along with it. 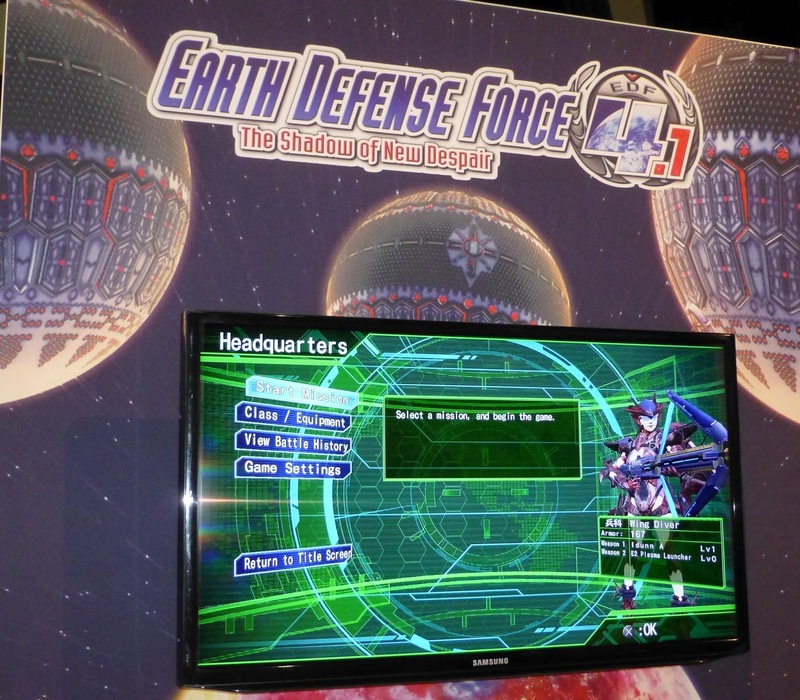 Surely there's fun to be had here, but as a critic, Earth Defense Force left me less than impressed. I've played some Street Fighter IV casually, but apparently I'm too much of a noob to tell any difference between that version and this. Obviously, the graphics are better and there are a few new characters, but I couldn't tell you what gameplay tweaks there were. If you're a fan of the series, you probably already know everything about SFV and don't need me to tell you anyway. I'm a pretty big fan of TrackMania on PC and it's a shame that it doesn't get more love outside of Europe. It's a racing game, yeah, but it's a unique one that has you racing through loops, half-pipes, jumps, and other madness in quick attempts at beating your own fastest time or the game's or other players'. The controls are always super tight, which makes shaving fractions of seconds off of your time a feat of true skill and precision. The series also has a big emphasis on user-created content, so there are virtually limitless options when playing online. Also because of this, much of the game is about how well you can adjust to new situations you've never seen before and get fast times on tracks you aren't familiar with. It's a skill-based, technical racing game and I highly recommend it to everyone. This entry in the series also promises to add a few new modes which change the way the vehicles handle and how the environments look. There's also Double Driver mode, which has two players controlling one car, with movement determined by the average of both inputs. I'll admit, that mode seems kinda ho-hum. Most exciting to me is the promise of randomly generated tracks which can then be shared online to compete on. The attendant who presented the game to me explained how TrackMania could be like a billiards table at a party, where people can jump in and try to set a record for a few minutes and see how they compare to all the other players. This is another game that I fear will fly under everyone's radar, but it's one of the ones I'm most hyped for personally. I would've skipped right over Gang Beasts if it didn't have a group of people roaring with laughter in front of it. It's a rudimentary fighting game where you control blubbery beasts which can grab and kick, with the goal of throwing your opponents off of the stage. It's simple and lacks depth, but the hilarious situations that can arise when playing make it quite fun to play, at least for ten minutes or so. Here's hoping it has more content in the final product to keep players entertained for longer than that. That's it for straight game demos. Did I miss ones you were hoping for? Sorry, but those will be coming out soon enough anyway. Virtual reality, on the other hand, I might not have the chance to try any time soon. And therefore, I ask that you continue on to Part 3! Welcome to What They Call Games' first year of E3 coverage, directly from the show floor! I already detailed my impressions of the demos I played and now it's on to the highlight of the show for me: Virtual (and Augmented) Reality! Holy crap, Morpheus is amazing. This was my first experience with VR and it felt like the same kind of leap in gaming technology as the jump from 2D to 3D for me. It was so immersive that I wanted to close my eyes at points since it was so creepy and real (I didn't though). It was also the only demo that made me want to immediately jump back in line to try it again, although on a different game if possible. Anyway, "Kitchen" is a horror tech demo in which your hands are tied and you're stuck in a chair in a creepy run-down kitchen. You can use your PS4 controller's motion controls to move your hands around, but otherwise you just watch helplessly as the scene unfolds around you. To start the demo, I had to knock over a camera that's positioned on a tripod in front of me by flinging your hands forward. Then, I noticed another guy in the room who was sort of stumbling around who then grabbed a machete and headed toward me. I thought he was an enemy at first, but it turned out he was in the same boat as me and offered to cut the ropes binding my hands (at which point I had to put my hands/the controller up for him to cut my bonds). This new buddy wasn't in the best of shape though, so he had a bit of trouble cutting the ropes. In fact, he had so much trouble that before he could finish, a creepy girl appeared in the background, sneaked up on him, and dragged him away screaming around the corner. As expected, my buddy was totally screwed, because a few seconds later, his disembodied head was tossed back into the kitchen in front of me. All I could do was watch as it slowly bled out and wonder when and from where the creepy girl would be coming back for me. Sure enough, she came from behind, blocking my vision with two bloody hands before moving around in front of me to taunt me with the now glistening machete right in my face. At this point I wanted to close my eyes because, I mean, I was about to get stabbed in the face! But I watched just a bit longer to see the girl lunge at me and everything go black - the end of the demo. So basically I guess you could call it a waifu simulator. Technically speaking, the scene filled my entire vision and turning my head convincingly turned the view with it. Moving the controller to move my hands also worked fairly well, although there were points where my hands didn't seem to be quite where I expected them to be. The only issues I had otherwise were that my glasses felt pressed uncomfortably to my face and that I was able to see the texture of the screen if I made an effort to focus on it. The scene also looked slightly blurred, but this may have been because the headset wasn't perfectly adjusted or because it was the atmosphere of the game (my character was probably out of it and had blurred vision). Overall though, as I said, Morpheus blew my mind and I'd love to try it again. 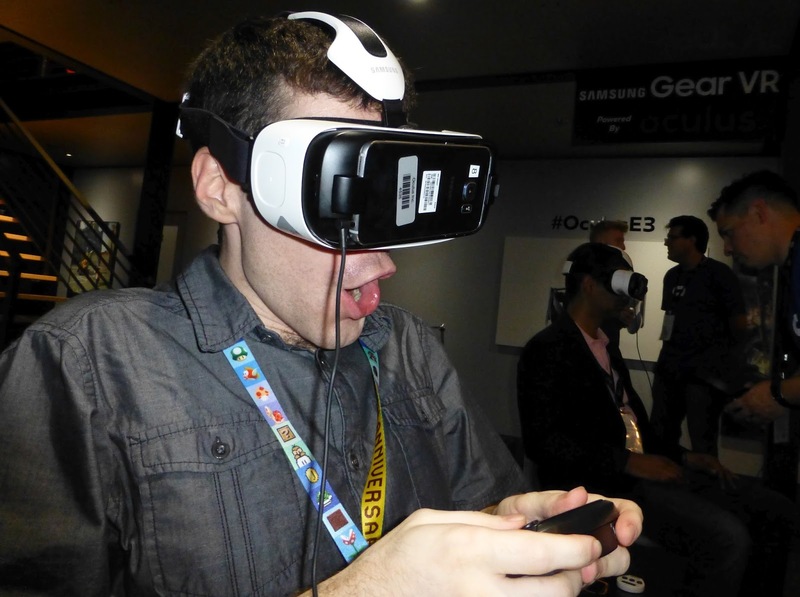 Having tried Morpheus, I was on the hunt for more VR experiences. 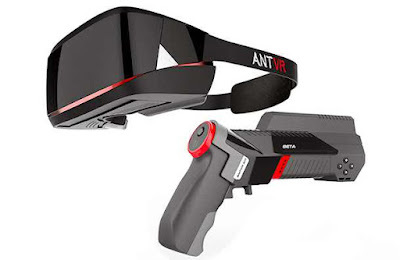 Ant VR was what I found next and it had a pretty short line... for good reason. This demo was of a rudimentary one on one first person shooter. You could look around by actually looking around and move and aim using a one-handed controller with you could point like a gun. The controller had a trigger and joystick nub as well, but it felt cheaply made and the joystick would often not respond. Not only that, but after only a couple minutes of playing, I started feeling sick to my stomach. I thought that this could've been because I hadn't eaten or drunk much and was also running on little sleep, but the nausea cleared up after I stopped the demo and I also heard that other people experienced the same discomfort. In any case, in it's current state, I wouldn't recommend Ant VR. Yep, that's me. Yep, I'm acting more into it than I really am. With the Oculus Rift line limited to people with reservations and a wait too long to fit into Day 2, I settled for trying the Oculus and Samsung phone-powered Gear VR. I had pretty low expectations going in, but Gear VR actually worked really well. It convincingly filled my vision, turned with my head, and came with a pretty decent controller in addition to the touch pad and button on the side of the headset. One downside was that I had to take off my glasses to use it, but it did have a focus slider which helped to keep things clear even without my glasses on (but the efficacy of this would likely vary for each person). Obviously the games weren't as graphically impressive as the other VR offerings since these all had to run on a smart phone, but even still, they were fun to try. I only had seven minutes to work with, so I tried three games (of which I forgot the names). The first game I tried was a flying and shooting game where I controlled a fighter plane with the tilt of my head and shot at various targets. It was pretty neat. The second game had me sitting in a jet-pack chair which I could fly around a city of simple polygonal graphics, through rings, and stuff like that. And the third game was a simple hack-n-slash top-down RPG (this one I remember was called Shironeko). It didn't seem like the sort of game you'd normally use VR for, but it was actually pretty cool because moving your head would change the angle you were looking at it from. It was like having a board game positioned in front of you with actual moving characters on it. So, anyway, Gear VR may not be Morpheus or Oculus Rift, but for what it is, it works impressively well. I'd want one. 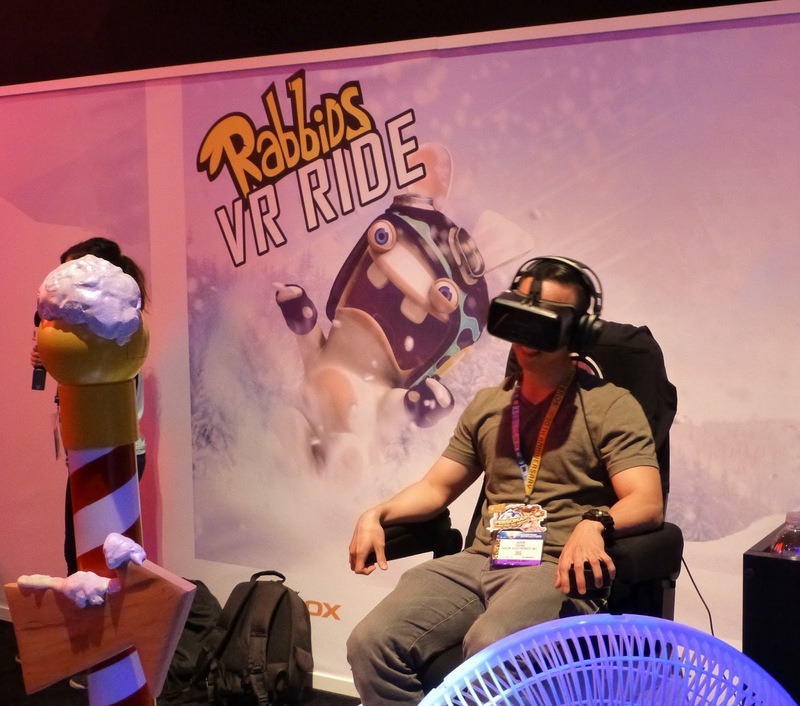 Unfortunately, I never did get the chance to play any of the big name Oculus Rift demos, but I did find this Rabbids demo off in a different area from the rest of the Oculus stuff. Rather than a game, this was more like the sort of thing you'd expect to see at an amusement park. The ride begins in a dark room which gradually lights up in different areas to reveal the maniacal Rabbids hard at work. It doesn't take long to realize they're hard at work knocking the sled you're sitting on loose to careen down the snowy mountain waiting just outside the doors ahead of you. From then on, it's a wild ride of jumps, spins, half-pipes, and cliffs with lots of silly Rabbid shenanigans along the way. Not only can you look around throughout the whole ride using the Oculus Rift, but this ride added to the immersion by having a chair that tilted according to which part of the simulation you were in (and a fan blowing at you too). Even though the chair only tilted up or down a few inches in each direction, the VR was so convincing that I actually felt the same sensation as being on a roller coaster. When going down a particularly steep hill or plunging over the edge of a cliff, I felt that tension in my chest and took an involuntary breath. Even though the graphics were stylized rather than realistic, I still felt very much like I was in the world of the simulation. It was a blast and I wish I could've tried the other Oculus Rift demos to see how they compared. Also, maybe it was because this demo had very little downtime, but I didn't notice any of the minor issues (such as blurriness and being able to see the screen texture) that I had with Morpheus on this demo. Finally, I was able to try Microsoft's HoloLens after a more than 4 1/2 hour long wait (and that was after running to get in line as soon as the doors opened). Rather than the virtual reality of Oculus and Morpheus, the HoloLens headset and glasses overlay what appear to be holograms over real life. These "holograms" look like they're really there in front of you and can be viewed from any angle as you move around them. The HoloLens demonstration began while we were still in line with "lab technicians" in white lab coats measuring the distance between our pupils for better fitting of the headset. The demo area itself was set up like the inside of a large space ship. We started in a small room with several chairs around one side and shelves of HoloLens headsets in the middle. One at a time, we were fitted for our headsets and adjusted them so that we could see four dots in the corners of our vision. From there, the HoloLens directed us with hovering waypoints which we walked to (in real life) down the hall. Just like in a video game, they floated in midair and counted down the distance between us and them. Reaching the first made a second one appear further down the hall. After turning the first corner, I was directed to look out of a hatch (actually just a solid wall which appeared to open through the Lens) where I was able to see into a large hangar bay and look around from different angles. After this, the rest of my team gathered with me in a circle in the briefing room with a hologram in the center (pictured above). Here we received instructions for the upcoming Halo 5 demo (which I described in detail on the previous page) on the various enemies which would appear, the map we would play on, and key points on that map. All of this appeared only through the HoloLens and could be viewed from any angle. Some of the models even appeared to come up out of or disappear into the center table. Once that was over, we were disappointingly instructed to remove our headsets and head in to actually play Halo 5. I have to say that the technology is pretty impressive and I'd love to try using it in different ways (Skyping with someone who appears to really across from you, for example). Unfortunately, HoloLens wasn't without issues. I don't know if these issues were caused by my eyesight and having glasses or by the headset not being properly adjusted, but I consistently had a problem with the HoloLens image only being visible on the top half of my vision. In order to see all of a particular hologram, I felt the need to tilt my head forward and look out just the top of the Lens like an old librarian looking over her glasses. This totally broke the sense of realism for me and made it painfully obvious that these holograms weren't really there. I tried to readjust the position of the headset myself to account for this, but my glasses didn't really leave room for it to move any further in the direction it needed to go. I mentioned this issue to one of the attendants, but their only advice was to try backing up a bit, which only really solved the problem by containing the hologram to the top half of my vision. Once again, this may have just been a problem with how the headset was adjusted to me, but if it takes pupil measurements and complex adjustments just to get it to work, it makes me wonder how well this will work for the average consumer. Without those issues though, I could see HoloLens really taking off and being used in some really cool ways. That's it for all the VR and AR demos I tried at E3 2015! It was the highlight of the trip for me, for sure, and I found myself wanting to try everything I could in VR. 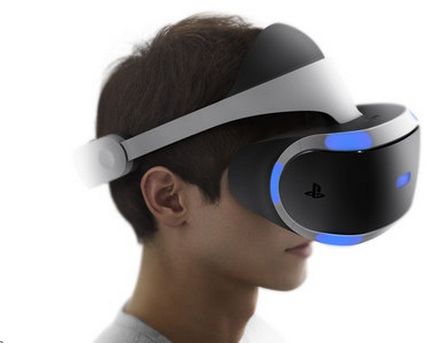 I think that rather than buying a new console, my next big gaming purchase may have to be a VR headset.